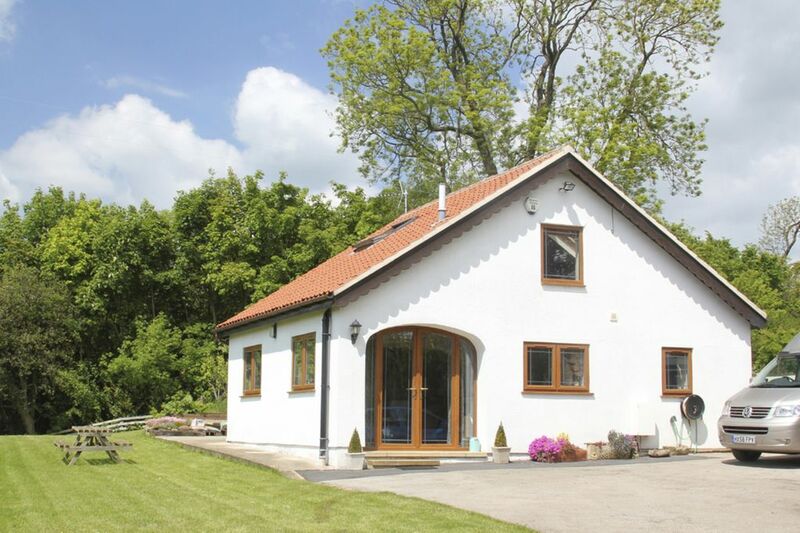 Tranquil & Scenic Woodland Setting Ideal For A Getaway Country Retreat near York. Dog friendly too! A contemporary one bed roomed apartment which is spacious and fully self contained on the ground floor of a detached annexe which sits within a working farm 300 feet above the city of York on a wooded hillside that lies between two castles. The dramatic ruins of King Richard III’s Sheriff Hutton Castle and the Baroque majesty of Castle Howard (famous as the location for the film and TV series Brideshead Revisited). Off the beaten track with big views over the Yorkshire Wolds & the Vale Of York, yet just 12 miles away from the ancient walled city of York. Our guests say they really love the peace and quiet here after a days sightseeing in York the Moors or the coast. The apartment has marble tiled floors with under floor heating for a very cosy winter break or a cool summer holiday. Bring along your walking boots or If you have one, bring your dog/s along too as we are pet friendly and surrounded by tranquil traffic free woods and fields to walk in. The walks to and around Castle Howard are particularly enjoyable. There is a charge of just £15 per dog stay. Luxurious & spacious wet-room en suite to the bedroom with marble tiled walls and floor with under floor heating, downlighting, large walk in shower with pine sauna style seat, vanity sink & storage unit, wc, heated towel rail, full mirror, extractor fan. Underfloor heating with individual room by room temperature controls powered by an air source heat pump. Free high speed wi fi is available. Flatscreen freeview TV, leather sofa, 3 seater double sofa bed, coffee table/games box, extendable dining table and chairs for up to 6,. The living room is also our art studio and has an interesting selection of art equipment, books, drawings & paintings. Fridge with small freezer compartment. Large freezer accessible if required. The kitchen & living room are open plan and has oven, hob, extractor, microwave, kettle, fridge with freezer compartment. Teas, coffee, sugar an initial supply of milk and a cookie jar included to help you settle in. Games box with assorted games like Scrabble. Large and enclosed with benches and seats overlooking the peaceful countryside. Sun terrace with picnic bench and garden deating. WALKING & Cycling: There's a network of great walks and bridleways straight from the ivy clad door. With a National Trail (Centenary way) running past the bottom of the drive, as well as the Yorkshire Moors, North Yorkshire Coast and Yorkshire Dales all within easy reach, Brush & Boot is an ideal place for any keen rambler. It's even possible to walk straight from the Brush & Boot door to see the delightful Baroque Mansion, Castle Howard. GOLF: Sandburn Hall Golf & Country club is 7 minutes drive away and there are a large number of other courses to choose from within 15 minutes drive. Notes on accommodation: The Brush and Boot is the name of our B&B and this ground floor self catering apartment can be combined with another large en suite family bedroom above it, to sleep up to 6 persons and makes a detached holiday cottage for either self catering or B&B basis. There is a sofa bed in the apartment living room suitable for 2 children or 1 adult and the additional en suite bedroom above can be arranged as a twin, super king size double plus up to 2 guest beds. This room is accessed via an external staircase and has great long distance views Outside: The gardens are large and back onto the woods with plenty of space to find a private spot to enjoy the views and the tranquillity. As well as the sheep, cows & ponies you may also spot some of the wildlife such as the Roe Deer, Hare, Squirrels, Woodpeckers, Hawks & Buzzards that help to make this a designated Area OF Outstanding Natural Beauty. There is a lively pond with frogs, toads & newts but watch the little ones! We have a guest barbecue and two barbecue areas for guests to choose from if the weather is kind as well as a swinging chair and 3 garden benches and whicker type garden armchairs. Cleaning / Towels / Linen / Maid service: Quality towels and linens and toiletries are provided as well as a beverages tray with cookie jar. A very thorough clean takes place before & after every changeover. A lovely property with everything we needed. Warm and welcoming in a beautiful situation. We enjoyed three wonderful days in beautiful Yorkshire, so much to see and do from York Minster to the moors and dales and the seaside all within an easy drive. We will be back. The cottage is spacious, well-situated, and impeccably clean. Richard is the ideal host — there when he’s needed and not when he’s not. There are sheep across one fence, fields across the others, and all around the gorgeous landscape of the Yorkshire moors. i would recommend this place to anyone who enjoys the peace and listening to the sound of the birds in the tree's the weather was very foggy and misty when we stayed however our two little dogs didn't seem to mind they loved the freedom of the whole garden. i would certainly be booking again the owner's richard and kim are a nice couple who are very friendly and make you feel very welcome. We were greeted by really friendly and polite owners who made us feel very welcome. Place is absolutely fantastic with comfortable bed and amenities, the heated floor is so nice to walk onto on cold mornings. Very close to york town centre and lots of places to visit. Qualified Tutor and Artist, Kim Burn, holds various group art workshops here at Woodend Art Studio (Brush & Boot B & B). Whether your group are looking to try something completely new or advance their art skills in a peaceful environment, Woodend Art Studio is the perfect location, and tutor Kim Burn encourages anyone to give it a go. Minimum of 2 / Maximum of 6 people per Art Workshop. Group Art Workshops run from 11am - 3pm.Group Art Workshops include buffet lunch & refreshments. All materials included. Luxurious under-floor heating ensures comfort on cool days.Free on-site parking. Accommodation available - Please mention when enquiring.Traditional Drawing and Painting techniques, work from your own photographs/our inspirational resources or still life sets to improve your skills. Work with a range of materials, brushes and papers. We are in a great position for getting out to the stunning North Yorkshire coast with Whitby, Scarborough & Filey beaches all approximately a 45 minute drive away. Leeds Bradford airport is approximately an hours drive away. Manchester International Airport is approximately an hour and a halfs drive away. Manchester is approx an hour and a half drive away. Newcastle airport is approx two hours drive away. All times are approximate driving times. York city centre is 12 miles away. York Park & Ride at Monks cross is a 15 minute drive away. Castle Howard is a 5 minute drive away. The A64 is 7 minutes drive away. Eden Camp is a 15 minute drive as is Malton. Flamingo Land theme park is 25 minutes away. Pickering is 25 minutes away. The North York Moors National Park is 25 minutes away. The Yorkshire Dales National Park is an hour away. There is free super fast broadband and free on site parking. The "Brush and Boot" is also a B&B so if any self catering guests decide they would like "the best of both worlds" and have our delicious breakfast…you can! a tasty option). If you would like something which isn't listed here, or if you have certain dietary requirements, then please let us know when booking.